In recognition of his outstanding contributions to the Ottawa Hospital Research Institute (OHRI) and to biomedical science, the OHRI’s Researcher of the Year Award has been named in honour of Dr. Michel Chrétien. The announcement was made at reception held by The Ottawa Hospital Foundation at the home of Bill and Jean Teron in Kanata. The reception was attended by senior members of the Hospital and the OHRI, as well as major sponsors of The Ottawa Hospital Gala. “Dr. Chrétien’s leadership has had a tremendous impact on the OHRI and I am delighted that we are able to honour him with the naming of this award,” said Dr. Duncan Stewart, CEO and Scientific Director of the OHRI, Vice President of Research at The Ottawa Hospital and Professor of Medicine at the University of Ottawa. Dr. Chrétien is known around the world for his prohormone theory and the discovery of pro-protein convertases. Since his group discovered these enzymes in 1990, research in the field has exploded and has led to therapeutically important insights into a number of diseases, including familial hypercholesterolemia, atherosclerosis, cancer and viral infections like SARS, avian flu and HIV. Dr. Chrétien has played a major leadership role in the Ottawa health research community, especially during his time as CEO and Scientific Director of the Loeb Health Research Institute, predecessor of the OHRI at the Civic Campus. He also founded the Ottawa Institute of Systems Biology and created the Regional Protein Chemistry Centre, thus allowing the OHRI and the University of Ottawa to attract top leaders in proteomics and related sciences. As cofounder of the International Consortium on Antivirals, Dr. Chrétien has coordinated networking between 200 scientists from 24 countries. Dr. Chrétien’s many awards and honours include the Henry Friesen Award and the Izaak-Walton-Killam Memorial Prize. He is also an Officer of the Order of Canada and Officier de l’Ordre national du Québec. In 2004, Monsieur Chirac named him Chevalier de la Légion d’Honneur de la République Française. 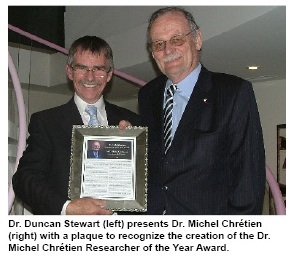 The Dr. Michel Chrétien Researcher of the Year Award will be presented each year at The Ottawa Hospital Gala, a major fundraiser for research at the OHRI. This year’s Gala will be held on November 8 at the Westin. The Ottawa Hospital Research Institute (OHRI) is the research arm of The Ottawa Hospital and is an affiliated institute of the University of Ottawa, closely associated with the University’s Faculties of Medicine and Health Sciences. The OHRI includes more than 1,300 scientists, clinical investigators, graduate students, postdoctoral fellows, and staff conducting research to improve the understanding, prevention, diagnosis and treatment of human disease.